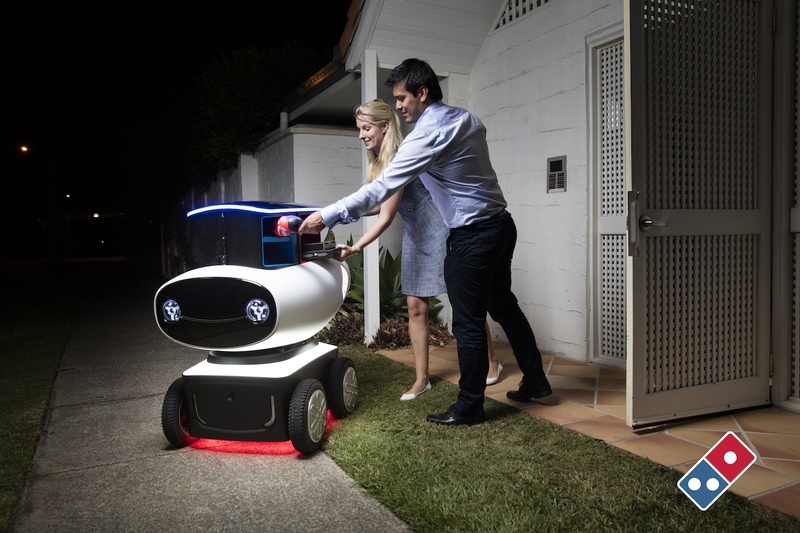 Domino’s, the worldwide pizza chain, announced a DRU, Domino’s Robot Unit, in Brisbane, Australia yesterday (Mar. 17). The DRU is a repurposed military robot that can now deliver pizza right to your door. It was developed in partnership between Domino and Marathon Robotics, an Australian startup. Here’s how it works: the DRU prototype uses Domino’s GPS data to navigate from the store to a customer’s house and drives on sidewalks, bike paths, and trails. The robot has sensors attached that allow it to move around obstacles—and lasers to gauge the distance from obstacles and prevent it from crashing into them—and can travel as fast as 12.5 miles per hour. Then, when it arrives at the location, the customer puts in a security code on their phone to open a locked compartment in the robot containing the pizza. Engadget says the robot will be testing in Australia over the next six months, but it could take up to two years before the technology is used throughout the country. Domino’s says it is working with global partners to expand the robot delivery service worldwide, too. So, while robots are taking jobs from humans, don’t expect pizza delivery jobs to be cannibalized just yet. “I think drivers are going to be around for a long time,” Domino’s Global CEO Don Meij told LifeHacker Australia. Domino’s did not respond to Quartz’s request for comment.